This was one of two illustrations Trego provided for the Century Company in 1887. The other work, Duel Between a Union Cavalry Man and a Confederate Trooper, was done as a black-and-white oil painting instead of a pen-and-ink drawing. The reason for this different approach in two works for the same commission is unknown. 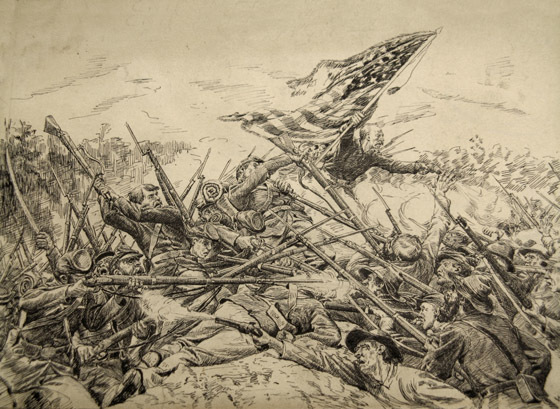 As an illustration for the article by G. Norton Galloway, “Hand to Hand Fighting at Spotsylvania,” Century Magazine 34, no. 2 (June 1887), p. 301. Battles and Leaders of the Civil War, vol. 4 (New York: Century Company, 1887), p. 170. “Losing the Romantic Illusions About War,” [Fredericksburg, VA] Free-Lance Star, 11 December 1981. Ron Field, American Civil War Fortifications (New York: Random House, 2005). The image was also issued separately as a print, and prints based on this image are still available today.